You need to support computers across your company, no matter how far they get from you. 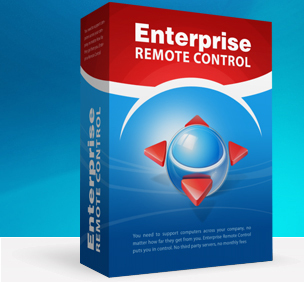 Enterprise Remote Control puts you in control. No third party servers, no monthly fees. Built to work around firewalls. The Enterprise Server performs calculations on each connection to find the most efficient route. No need to ask users for IP addresses, or open firewall ports. You need to support users no matter where they are, or where they travel. If a computer can get on the Internet, you can administer it. Designed to work well with newer versions of Windows. Not an afterthought, but built from the ground up to support the latest. Have older versions of Windows? XP and 2003 work great with Enterprise Remote Control. 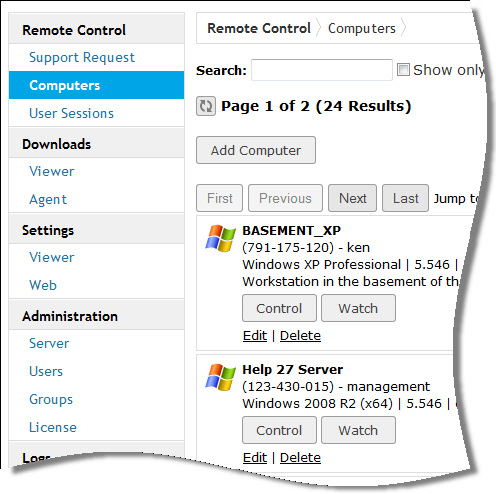 The Enterprise Remote Control Server keeps track of all the computers you want to access. Sales lady across the country needs support from a coffee shop? No problem, the Enterprise server will negotiate the connection within seconds. Our super fast search will help you find computers quickly. Instead of having users look around for IP addresses, you can just start typing their login name and connect. Connections are fully encrypted using 256 bit AES encryption.